The usually strictly-secretive Apple has apparently slipped a little this time revealing two of the major attractions of tomorrow’s event. Apple has not only confirmed the launch of iPad Air 2 and iPad mini 3 tomorrow but has also leaked some of the primary features of the new tablets set to be launched tomorrow. In a completely un-Apple-ish way, Cupertino has let go of some of the details of upcoming tablet duo. 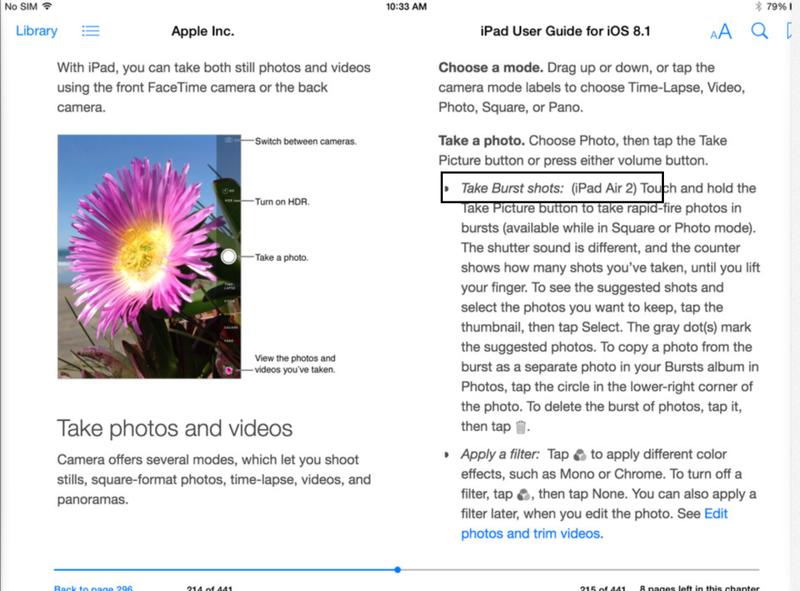 The company released some early user guides for iOS 8.1 which appeared on the iTunes Store. 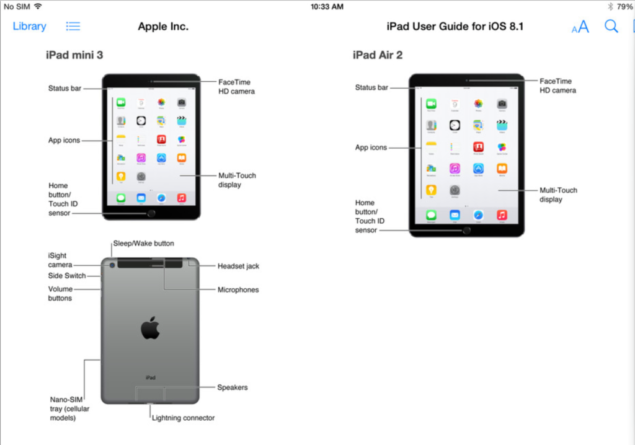 What is striking though is the presence of iPad Air 2 and iPad mini 3 references in those manual guides confirming that the 2014 iPad duo will indeed feature the Touch ID fingerprint sensor. Apple is certainly not a fan of leaks and is taken as one of the most secretly-guarded company for its products. However, in this earlier than expected manual, Apple has shared one of the most attractive feature of its upcoming tablets. The screenshots also confirm that the iPad Air 2 will feature a new camera Burst mode which will help users to quickly take multiple shots of a scene while holding down the shutter button within a very small period of time. Touch ID fingerprint sensor has strictly remained a feature of iPhone debuting with iPhone 5s and then featuring on iPhone 6 and iPhone 6 Plus. With this year’s big release of Apple Pay expected to arrive with iOS 8.1, it was rumored that the company will feature fingerprint sensor to equip the tablets be a part of the new mobile payment system. The upcoming iPad Air 2 and iPad mini 3 will run on iOS 8.1, says the iPad User Guide iBook. The devices are set to launch tomorrow along with a refreshed line of Macs. Apple’s iOS 8.1 is expected to release and roll out on October 20.